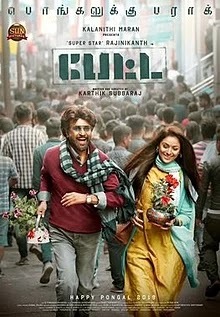 Cast & Crew Rajinikanth,Vijay Sethupathi,Simran,Etc..
Petta Petta poster.jpg Poster Directed by Karthik Subbaraj Produced by Kalanithi Maran Written by Karthik Subbaraj Starring Rajinikanth Vijay Sethupathi Simran Trisha M. Sasikumar Nawazuddin Siddiqui Bobby Simha Music by Anirudh Ravichander Cinematography Tirru Edited by Vivek Harshan Production company Sun Pictures Distributed by Sun Pictures Release date 11 January 2019 Country India Language Tamil Petta (lit. City) is an upcoming Indian Tamil-language action film written and directed by Karthik Subbaraj and produced by Kalanithi Maran. The film stars Rajinikanth with an ensemble cast including Vijay Sethupathi, Simran, Trisha, M. Sasikumar, Nawazuddin Siddiqui, Bobby Simha, J. Mahendran and Guru Somasundaram. Pisachi movie hero Naga and Megha are lovers in the campus. Simran is introduced as a pranic healer. Megha Akash makes an entry as the first-year student and Bobby Simha is after her.